Eric Goldman from IGN just sat down with Nick Offerman for an interview about the final season of Parks & Rec. 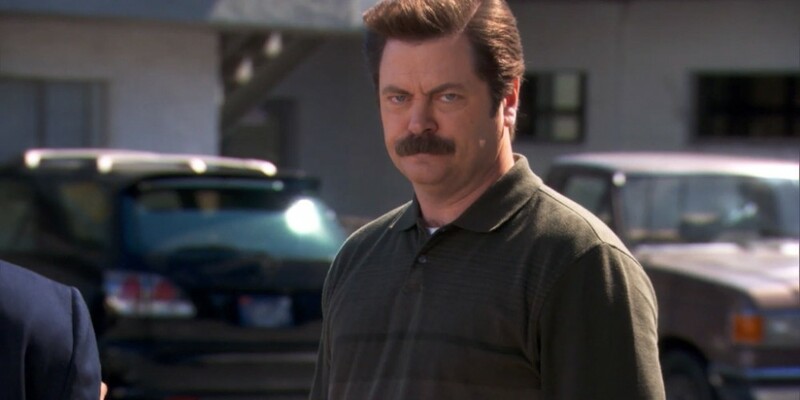 Ron doesn’t strike me as the kind of guy that could ever change much. I think that’s one of the loveable things about him. But the way I’ve seen him erode – his granite façade has sort of eroded over the seasons as he’s learned to love a family and found a relationship that he can stomach. We jump into the future and I think I can say Ron gets involved in selling someone’s children into white slavery in a funny way. It’s very funny. And ultimately tear-jerking. There’s a great sort of Old Yeller scenario that I think viewers will love. You can see a season7 clip, and read the whole Nick Offerman interview here.